Soak the anchovy fillets in a little milk. Cut the cheese into slices, season with salt and pepper and put into a bowl with 1/3 of the oil to marinate for 10 minutes, turning now and then. Cut slices of bread to the same size as the cheese, and toast lightly. Thread alternate pieces of toast and cheese on to 4 metal or wooden skewers, ending with toast on each side. Brush an ovenproof dish with oil and put in the kebobs, resting the ends of the skewers on its edges. Put in a moderately hot oven 200°C (400°F) for 20 minutes, brushing every so often with the cooking juices. Just before the kebobs are ready, heat the remaining oil in a very small pan and fry the drained anchovy fillets until melted. 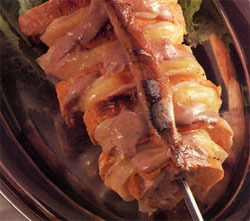 Arrange the kebobs on a heated serving dish, pour the anchovy sauce over and serve hot.